There she is – my very first fountain pen. The dentist I worked for at the time took our only other employee and me shopping for Christmas prezzies. He pushed thick envelopes filled with crisp bills into our hands and said the only condition was that we had to get something 100% for ourselves, “something you wouldn’t normally buy.” Lisa and I each knew exactly what we wanted and set off in opposite directions. She ran off to the Coach handbags and I, on the other hand, wandered over to men’s accessories in search of a fountain pen. A who? A what? I was clueless. A fountain pen! That’s what I wanted needed. Choosing my first fountain pen was a breeeeze. I knew nothing. “Would you like a medium nib?” Sure! “Does that feel balanced in your hand?” Uh huh. “Do you like the grip? Is it to heavy?” I love it! I’ll take it! “Do you need some cartridges to go with it?” Yes! I got the pen home, tossed the box, the paperwork, and whatever that weird twisty thing was over my shoulder and into the trash. I have a fountain pen! How do I make it go? A whole bunch of years, and inks, and pens later, and I find myself returning to my old friend: the Waterman Expert. I snapped a few quick pictures, hastily scribbled some notes, and finally it was time to ink her up for the first time in at least eight years. I chose one of my current favorite inks – Noodler’s Lexington Gray and (seriously) when I put pen to paper, it gave me goosies (as J Lo would say). Balanced. Comfortable grip. Not too heavy, not too light. An oh-so-satisfying click when the cap was posted. This was going to be great. I was practically giddy. Then I started to worry that I’d remembered this old pen with a little too much fondness. That perhaps now that I’ve experienced other wonderful writing instruments that this one wouldn’t quite measure up. I had nothing to worry about. A generous medium nib, so smooth over the Rhodia paper. Wonderful shading (that thing I’d seen, but didn’t have the words to describe all of those years ago). No skipping or false starts (maybe one). Just. Beautiful. Some pitting on the two-toned gold nib. See the separation between the tines? That is some goodness right there, folks. You notice that I didn’t call it an Expert in my writing? That’s because I had to do some sleuthing to figure it out. 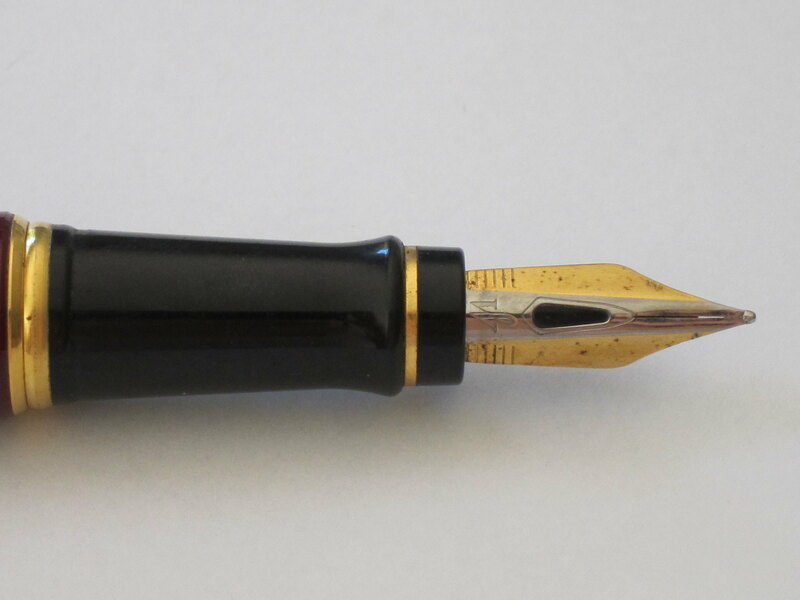 This has been fun – remembering and writing about how I first fell in love with fountain pens. Do you remember your first love? I’d love to hear all about it. 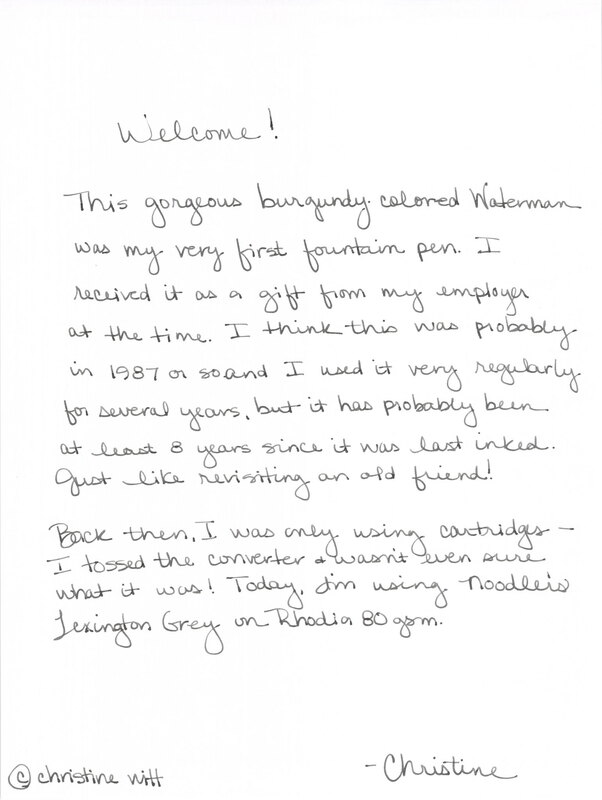 This entry was posted in FOUNTAIN PENS, LOVE and tagged waterman by Christine (Pentulant). Bookmark the permalink. I have the same model Expert 1 pen, in burgundy, in the original box, as new! I bought mine in 1994 – but thought that they were first introduced in 1993, but if you got yours in 1987, I must be wrong. I can't say how they write, because I've never used mine! Thanks for stopping by! Crazy/cool that you still have yours in the box unused! I love mine – love. I moved away from that job before 1993 – so I'm sure it dates before then. I want to think I got it before my son was born and that was 1989. I'll need to see if I can research a bit and pin it down. Thank you again for commenting. I was just looking these up, because I too rediscovered mine. It turns out what you and I have is the Expert I. There's also an Expert II and III being made now. Although they look somewhat similar, the bodies are laquer over brass (instead of all plastic) and the nib is different. They don't feel or write the same from what I understand. And it seems that folks who have the different versions often prefer the first version. I bought mine because it was practical and cheap at the time. But it has outperformed my more expensive pens as a daily writer, including a Waterman Opera and even my Mont Blank Meisterstuck. Thank you so much for posting! 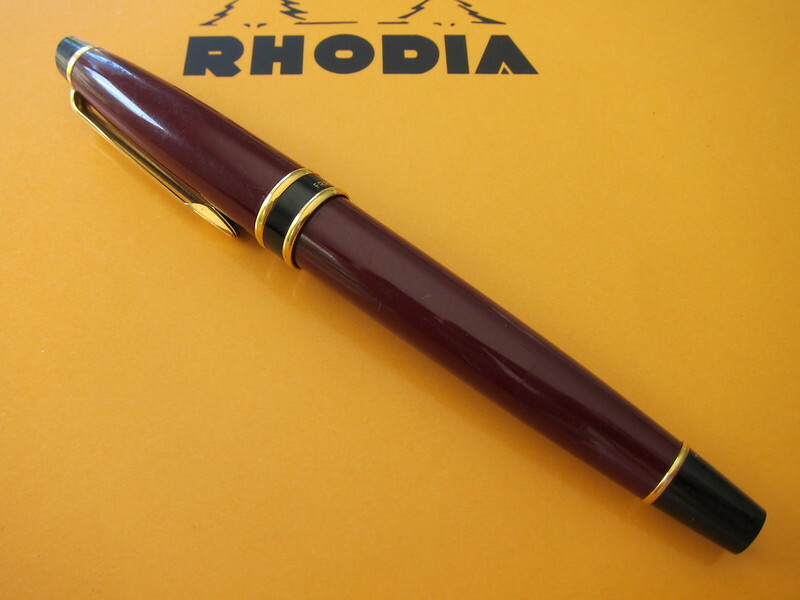 I've not seen other pens like this one – and no one really talks about having it as early as I believe I had mine. Do you remember what yours cost? My guess is around $150-200, but I can't be sure. Now I want to ink it again. I have the same model as well, which I received as a gift, along with the matching mechanical pencil, in 1999. Mine is still perfect, with absolutely no corrosion on the nib. It performs flawlessly. I can’t imagine why even a complete pen novice would merely “toss” the cartridge converter. Pretty dumb.